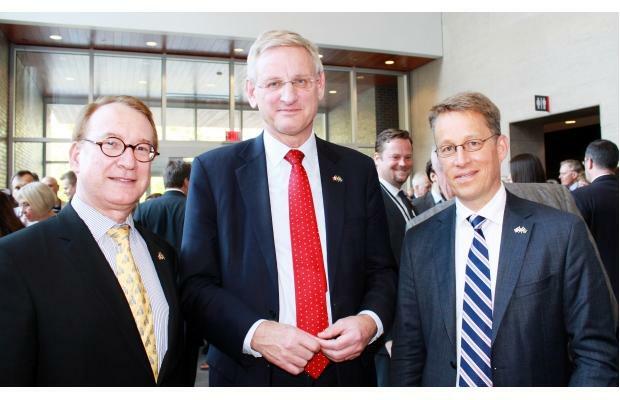 Swedish Foreign Minister Carl Bildt delivered a lecture to over 300 people at Carleton University last month entitled “Arctic Challenges and the Future Perspectives of Arctic Co-operation. He starts off by discussing how, “more than anything,” Canada and Sweden are linked by geography as they both extend into the Arctic. The two countries also share other commonalities, including similar lifestyles and a love of nature. Even their per capita GDPs are almost identical: according to the IMF, in 2011, Canada’s was $40,541 while Sweden’s was $40,394. Commercial potential for shipping was high as was the promise of resources in Sweden’s northernmost region, Norrland. Bildt quotes 17th-century Swedish Lord High Chancellor Axel Oxenstierna, who remarked, “In Norrland we have an India within our borders, if only we realize we should be taking advantage of it.” Today, Sweden is the largest exporter of iron ore in the EU. Like Quebec, which is currently pushing its Plan Nord, and more generally Canada, much of the country’s mineral resources lie in the North. The iron ore mines are in the northernmost part of the country, and there are also gold mines a bit farther south. In the 1990s, Sweden suffered a financial crisis of its own after the bust of a housing bubble and poor oversight of the banking industry. Between 1990 and 1993, GDP fell 4%. Yet, the country was able to come out of the recession successfully by having the government recapitalize the banks, a process which the New York Times explains in more detail. With Nordic countries’ economies now doing well (and this despite their generous welfare policies), their governments now have the bandwidth to turn to problems that would otherwise be of secondary concern, such as sustainable development. Oftentimes during a recession, policies that might be seen as harmful to industry such as carbon caps or taxes are cast aside. Annual GDP growth of Sweden, Spain, and Greece compared. Note how Spain and Greece grew faster than Sweden in the 1990s and early 2000s, but it is now close to surpassing both. Bildt advocates multilateral fora and cooperation as the way to both “seize opportunities and meet challenges.” He lays out four main areas on which the Arctic Council should work. 1) More concrete decisions: In the past, the Arctic Council focused mainly on promoting and producing scientific research. Last year, the Search and Rescue Agreement was a milestone for the Council as it was the first substantive agreement between all eight member states. The next agreement that will likely be reached concerns preparedness and responses to oil spills, for which a task force has been established with the idea of having something in place at the next ministerial meeting in 2013. 2) Improved communication: The Arctic Council basically needs better PR. So far, the Council has emphasized scientific and research reports, which has been very helpful for promoting polar research. But more needs to be done to tell the actual story of the work being done and establish the Council’s credibility. Bildt is doing his part, for instance, by tweeting and blogging (though at a quick glance, most of his posts are more related to his work as foreign minister rather than the Arctic, per se). The Arctic Council approved a communications strategy (PDF) at the Deputy Ministers’ meeting in May, and this is a good first step to raising the club’s profile. 3) Focus on the human dimension: More attention should be paid to developing the Arctic with its 4 million residents in mind, particularly indigenous peoples. Bildt calls for more corporate responsibility in the Arctic and says that Sweden is focusing on working with businesses to help provide water and food security, which are important for Northerners. For instance, in Canada, Manitoba has recently been attempting to make milk more affordable for northern communities, for whom it is reportedly $20 for four liters. 4) Make the Arctic voice heard: A common policy should be stated, whether with regard to climate change, science, or indigenous peoples. This seems to actually be one of the most difficult challenges to tackle as there are often huge gaps in national perception and policy. To illustrate, Sweden and the U.S. are still miles apart on climate change while Canada and Russia vastly differ in their treatment of indigenous peoples. Sweden is a little more than halfway through its tenure as chair of the Arctic Council. So far, it seems to have done a good job of raising the profile of the Council and focusing on issues of growing importance in the Arctic as the ice melts–namely oil spill preparedness and responsible entrepreneurship. As oil companies enter the melting waters of the Arctic, both will become necessary. Speeches by the Sweden’s top-ranking diplomat do a good job of creating awareness of the challenges the world faces in the Arctic. Other foreign ministers should do the same to bolster the region’s visibility. The full text of Bildt’s speech is available here.